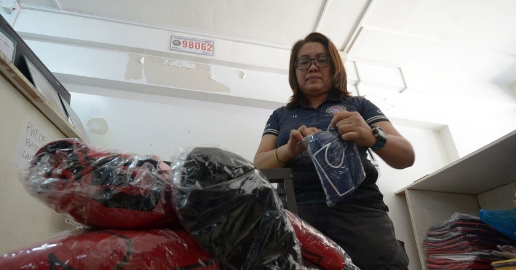 Authorities confiscated hundreds of fake Reefside Surf Co., a brand of locally-made rash guard apparel in two simultaneous operations in the city yesterday morning. The alleged owner of the store in C. Bangoy Street, Poblacion District and stock house in Barangay Catalunan Grande, Talomo District was arrested. Chief Insp. Milgrace Driz, the Davao City Field Unit (DCFU) head of the Criminal Investigation and Detection Group (CIDG), identified the suspect as Irish Barcelo Felix, proprietor of Irish Online Shop. Driz said they seized a total of 285 pieces of counterfeit Reefside shirts in both venues. Driz said the CIDG-Oplan Omega Shopper was conducted in line with President Rodrigo Duterte’s directive to go after economic sabotage. “We are on our strong campaign against personalities (who are) violating laws on economic sabotage,” she said. The operatives were armed with four search warrants issued by Executive Judge Emmanuel Carpio of Regional Trial Court-Davao City as they raided the house in Purok Dagapansan, Catalunan Grande, and Bangoy Street at 11:30 a.m. yesterday. In an interview with reporters, Driz said they received a complaint on the selling of fake Reefside apparel. They conducted a test buy and it turned out positive. Felix is detained at the CIDG pending the filing of the case. In an interview with ABS-CBN’s Southern Mindanao TV Patrol, Felix denied those confiscated items were fake. Reefside is a popular Davao-made athletic shirt. Both Mayor Sara Duterte and younger brother Sebastian have been seen wearing the shirt brand. Even former vice mayor Paolo thanked Sebastian on his Facebook for giving him a Reefside shirt. In 2016, Sebastian partnered with ReefSide for the charity shirt for the Mariphil Children’s Village.